You don’t need fully pay the whole amount of Samsung Galaxy Note 8 when you apply to Smart Postpaid gadget plan. 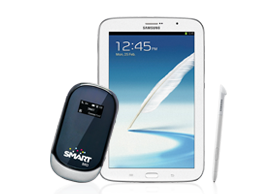 For only 999 pesos a month you can have this tablet plus at free Pocket Wi-Fi with free internet surfing hours. You like that right? Take two gadgets in one all in plan plus you don’t need to worry of hidden charges at it is equipped with Anti-Bill Shock. If you’re on a tight monthly budget you can Smart Plan 499 with free Acer Iconia B1 tablet with free Pocket Wi-Fi and 30 hours of internet browsing. As indicated this Note 8.0 has only Wi-Fi connectivity feature, no 3G or SIM card slot support that’s is why it bundled with Pocket Wi-Fi for you to use in connecting your tablet to a cellular network.